The smart specialisation strategy quickly became popular in the European policy market as a new approach to innovation policy. However, to date there has been little empirical evidence on the effectiveness of the approach. This column sheds light on the question by examining a precursor programme of subsidies in Italy between 2007 and 2013. Results suggest that collaborations that are not the result of an open and unconstrained search for the best partners – that is, those that are induced by public policy incentives – fail to generate positive impacts. The smart specialisation strategy (S3) emerged from the Knowledge for Growth expert group in the framework of the European Research Area (Foray et al. 2009) to explain the productivity gap between Europe and the US in terms of their differential penetration of information and communication technologies. According to Foray et al. (2011: 7), smart specialisation is “… largely about the policy process to select and prioritise fields or areas where a cluster of activities should be developed, and to let entrepreneurs discover the right domains of future specialisation”. The S3 advocates the concentration of public resources in a set of clearly defined predetermined priority areas to be selected with a bottom-up approach based on a process of ‘entrepreneurial discovery’ (all relevant stakeholders should cooperate to elaborate the best possible innovation strategy for their own developmental future). The architecture of the 2014–2020 Cohesion Policy of the EU rests on the assumption that the ‘smart specialisation’ principles are applicable to all regions – “Innovation is important for all regions; for advanced ones to remain ahead and lagging ones to catch up” (European Commission 2010: 3). Despite being a recent concept with limited theoretical elaboration, the S3 approach recorded an unprecedented success on the European policy market. The adoption of S3-inspired programmes was so rapid that it allowed very limited room for small-scale trialling, or for policy learning before large-scale implementation. Therefore, S3-inspired programmes in the 2014–2020 programming period lack a rigorous evidence base on their effectiveness and value added, in comparison with pre-existing policies. What is the evidence on the impact of the innovation policy tools implemented so far by the EU regions? A recent comprehensive review of impact evaluation analyses of publicly funded programmes supporting innovation highlighted that only 17 out of 42 reviewed papers identified some positive impact of active innovation policies on productivity, employment, or other measures of firm performance (e.g. sales, turnover, profit). However, some of the findings seem to suggest that some key S3 principles might work – for instance, programmes emphasising public-private collaboration tend to perform better than those that exclusively support private firms. The magnitude of the financial resources mobilised by S3 makes filling the gap in the policy knowledge base especially urgent. If it is too early for any credible counterfactual assessment of the impacts of S3 measures, it is still possible to look into the copious experience accumulated over previous programming periods in order to identify suitable programmes that brought forward (at least some of) the features of the ‘new’ programmes inspired by the S3 approach. Collaborative Industrial Research (CIR) is a scheme of the Research and Competitiveness Programme, which accounts for almost 50% of the total budget of the National Operational Programmes co-funded in Italy by the 2007–2013 EU Cohesion Policy. The CIR budget – roughly €1 billion jointly funded by the European Regional Development Fund and national sources – is intended to subsidise industrial research projects undertaken by firms located in less developed Italian regions (i.e. Calabria, Campania, Apulia, and Sicily). The CIR competitive funding scheme is coordinated by a national strategic unit and activated by local stakeholders in collaboration with each other. Firms apply for funding made available by the programme by submitting detailed project applications based on the identification of their own priorities and collaboration strategies with other firms and other research-active local stakeholders. The CIR guidelines dictate that each project should be submitted by multiple firms and that consortia that also include research centres would be favoured in the selection process. There are nine pre-selected highly innovative activities eligible for funding: information and communication technology; advanced materials; energy and energy saving; health and biotechnology; agro-industrial system; aerospace and aeronautics; cultural heritage; transport and advanced logistics; and environment and safety. Only projects that fall clearly into one of these priority areas are eligible for funding. In a recent study, we were able to exploit the scoring system that assigned funding to submitted projects – only the projects that received by independent examiners a score above the cut-off of 104.4 were actually funded (Crescenzi et al. 2018). Thus, we assess the impact of the programme (in terms of first-order effects on investments and second-order effects in terms of value added and employment) by means of regression discontinuity design techniques. By looking at the interaction between the impact at the threshold and some features of the firms and the projects, we also analyse the extent to which the specific S3 features of this programme influence effectiveness. Finally, we provide far-from-the-threshold inference, by using the Angrist and Rokkanen (2015) conditional independence assumption. For instance, we are able to predict what would have happened if firms with scores below the funding threshold (and therefore not funded) would have gained access to the scheme by virtue of a more generous funding of the programme. Our findings offer a mixed picture. The average impacts at the threshold in terms of investments, value added, and employment were quite limited. 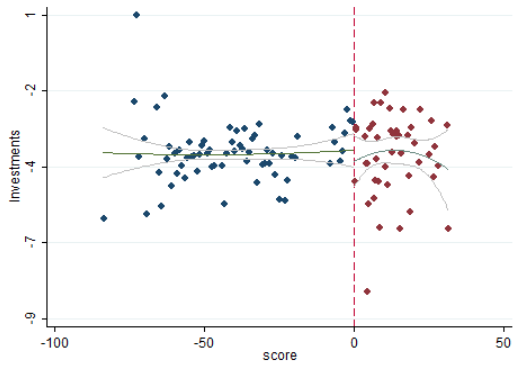 For the three outcomes we found a negative (though non-significant) average effect. Figure 1 gives a graphical representation of our analysis for the investments outcome (the 104.4 threshold has been set to zero in the figure). Far-from-the-threshold extrapolations (possible only for the employment outcome) suggest that it is unlikely that a more (or less) generous level of funding of the scheme would have affected the programme’s effectiveness. The results offer limited support for the practical benefits from the collaborative dimension (proxied by the number of firms participating in a single project) or for the inclusion of research centres in the project partnerships (the presence of a university is associated with a positive impact on employment, which however does not carry over higher investments or value added). The pre-selection of high knowledge intensity areas of activity does not generate additional benefits when compared to more traditional technological domains. The programme was more successful in supporting firms in low-tech sectors. Finally, the effectiveness of the scheme on value added (investment) is higher (lower) for firms with high patenting capacity, while there seems to be scant support for the idea that multinational corporations are key to successful innovative collaborations. Notes: Quadratic polynomial relations. Each point represents the average investments variation. Treated side is in red (right part of the graph). It will be too ambitious to provide full-fledged policy implications from a single exercise (based on a forerunner programme). A few tentative remarks, however, are in order and might offer an initial evidence-based contribution to the ongoing debate on the future of EU policies after 2020. Our analysis calls for a cautious approach to the reform of innovation policies. The simultaneous introduction of new features (i.e. conditionalities and requirements in innovation programmes) might be a risky choice if not accompanied by specific processes consolidating the policy framework. In general, gradualism in policy reforms might be the best approach until robust evidence is produced on the impact and value added of alternative policy options. Collaboration is an increasingly important feature of all innovative activities (Crescenzi et al. 2016). However, when collaborations are not the result of an open and unconstrained search for the best possible partners but – on the contrary – are induced by public policy incentives, they fail to generate positive impacts. The collaborative dimension should not be a requirement, but should be supported only when a clear rationale is provided in light of the specific technological problem that the applicant intends to solve. The pre-selection of high knowledge intensity areas of activity might be a limitation. Where more traditional technological domains can be identified as a potential source of competitive advantage (in particular in less developed regions), policymakers should probably not signal any preference in the allocation of funding in favour of more advanced sectors. At the moment many less-developed EU regions – irrespective of their initial conditions – have submitted their S3 operational programmes, placing a strong emphasis on advanced technological domains in an attempt to maximise their chances of receiving funding for their ‘smart’ choices.Whether these choices will actually pay off deserves careful evaluation. What is certainly needed for post-2020 EU innovation policies is the design of appropriate feedback mechanisms allowing the policy paradigm to evolve in response to new evidence on its intended (and unintended) impacts. Authors’ note: The views expressed here are those of the authors and do not necessarily reflect those of the institutions with which they are affiliated. Angrist, J D and M Rokkanen (2015), “Wanna get away? Regression discontinuity estimation of exam school effects away from the cutoff,” Journal of the American Statistical Association 110:512: 1331­–1344. Crescenzi, R, G de Blasio and M Giua (2018), “Cohesion Policy incentives for collaborative industrial research: evaluation of a Smart Specialisation forerunner programme", Regional Studies, DOI:10.1080/00343404.2018.1502422. Crescenzi, R, M Nathan and A Rodríguez-Pose (2016), “Do inventors talk to strangers? On proximity and collaborative knowledge creation,” Research Policy 45(1): 177–194. European Commission (2010), "Regional Policy contributing to smart growth in Europe 2020", Communication to the European parliament, the Council, the European Economic and Social Committee and the Committee of the Regions, COM/2010/0553 final. Foray, D, P A David and B Hall (2009), “Smart Specialisation – The concept,” Knowledge Economists, Policy Brief No 9. Foray, D, P A David and B Hall (2011), “Smart Specialization: From academic idea to political instrument, the surprising career of a concept and the difficulties involved in its implementation,” MTEI Working Paper.